Lucas Punkari/Daily Herald Prince Albert Raiders rookie forward Jakob Brook celebrates after scoring his first career WHL goal in Friday's home opener against the Regina Pats. Since the first game of the 2016-17 campaign, the Prince Albert Raiders have been unable to solve the Regina Pats. That 15-game skid against their East Division foes came to a convincing end Friday night at the Art Hauser Centre as the Raiders cruised to a 7-2 triumph in their opening contest of the 2018-19 Western Hockey League season. “Well I guess you could say that we were due,” Raiders head coach Marc Habscheid said after the game. “The odds were in our favour I guess. Friday’s triumph also marked the first time that the Raiders had beat the Pats on home ice since Feb. 12, 2016, a streak that spanned nine games. It was a night to remember for the 18-year-old forward from Yorkton as he notched his first career WHL hat trick in his 119th career game. “I think the last time that happened to me was during the playoffs in Midget with the Yorkton Maulers,” Miller said. “I usually don’t remember the shifts after they happen as I’m always trying to move forward, but I can remember all three goals tonight. The 21st overall pick in the 2015 WHL Bantam Draft, Miller’s sophomore season was a rough one as he scored a single goal during a 69-game campaign after finding the net seven times in 46 contests during his rookie year. 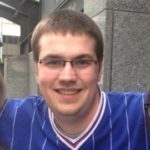 “We’re really happy for him to get off to a good start,” Habscheid said. “It was a tough year for him last year as we could tell he wasn’t quite where he wanted to be after having shoulder surgery. It was also a big evening for Raiders rookie forward Jakob Brook, as the second round pick in the 2017 WHL Bantam Draft made his WHL debut. The Roblin, Man. product sped down the wing late in the first period and sniped a shot by Paddock for his first career WHL goal to the delight of the 2,775 in attendance. “I was thinking a lot of things at the same time once the puck went in,” Brook said. “I didn’t know what to do. It was a memorable day for the Brook family as his older brother and Moose Jaw Warriors blueliner Josh signed an entry-level contract with the NHL’s Montreal Canadiens. “It’s a pretty happy day to be a Brook right now,” Jakob said. Brett Leason had a goal and an assist for the Raiders, while Sergei Sapego and Eric Pearce also lit the lamp. Cole Fonstad, Sean Montgomery and McDonald each had a pair of helpers in the triumph, which saw Ozzy Wiesblatt and Protas record their first WHL assists. Ian Scott got the start in goal for the hosts and turned aside 19 shots. Duncan Pierce scored his first career WHL goal for the Pats in the loss, while Aaron Hyman also found the back of the net. Paddock made 38 saves for the visitors. The East Division foes will do battle again tomorrow night at the Brandt Centre at 7 p.m., where the Raiders will look to win their first road game against Regina in seven attempts. The Raiders will return to the Art Hauser Centre next Friday night to face the Medicine Hat Tigers. 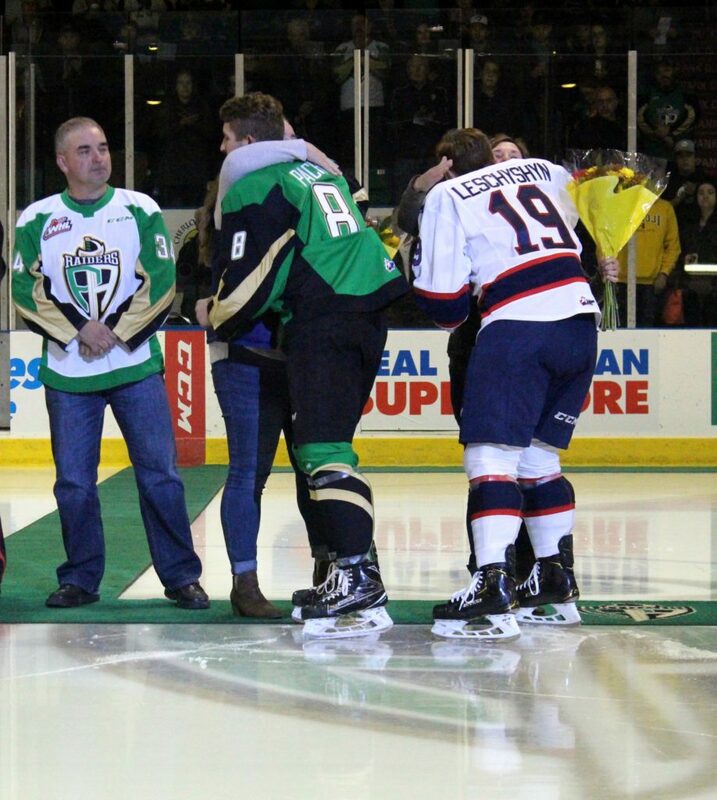 Adam Herold’s father Russ watches on as his daughter Erin and wife Raelene were embraced by Prince Albert Raiders captain Brayden Pachal and Regina Pats captain Jake Leschyshyn prior to Friday’s game. It was an emotional lead-up to the start of Friday’s game as the Raiders paid tribute to defensive prospect Adam Herold, who was slated to join the team this year before losing his life in the Humboldt Broncos bus accident in April. “Words can’t really describe it,” Miller said. “I knew him personally and we grew up together playing against each other. Herold’s father Russ, sister Erin and mother Raelene received a standing ovation from the crowd prior to the game as they received flowers from Pachal and Pats captain Jake Leschyshyn. A framed Herold jersey and a plaque has been installed by the team and will reside between sections three and four of the Art Hauser Centre, which is in honour of the number 34 he wore for the squad. A We Play for Them banner, which is in all Junior A rinks this season, was also unveiled Friday prior to the game and will reside in all five Saskatchewan WHL arenas. After a slow start, Miller scored twice on the man advantage in the third period to help the Raiders finish the night with two goals on six attempts, while the Pats failed to solve Scott on their two power plays. 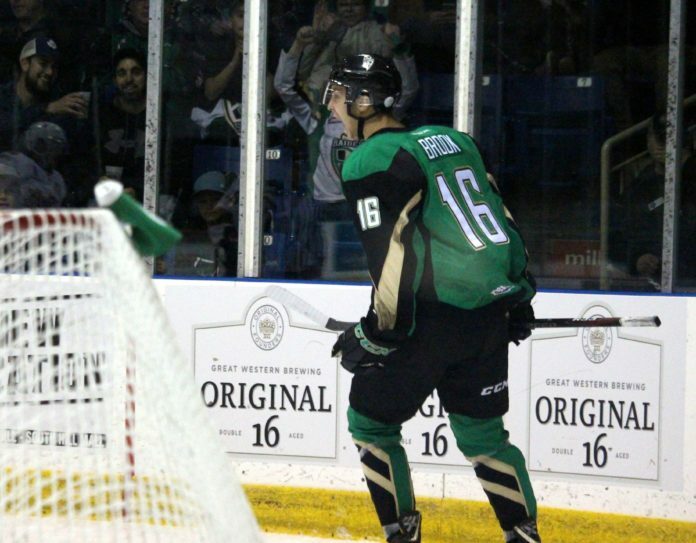 Miller’s hat trick was the first for the team since Jordy Stallard scored three goals in a 5-1 win over the Swift Current Broncos on Nov. 3, 2017. Mike Winther was the last Raider to find the net three times against the Pats during a 6-3 triumph on Dec. 6, 2011. In addition to Kelly, goaltender Curtis Meger, defenceman Lane Kirk and forwards Nikita Krivokrasov were all scratches for the Raiders. The Pats did not dress goaltender Kyle Dumba, blueliners Steven Zonneveld, Brady Pouteau and Parker Galvas, along with forwards Cole Dubinsky, Justyn Gurney and Riley Krane. They were also without the services of overage defender Cale Fleury, who is with the Montreal Canadiens at their training camp. Prior to Friday’s game, the Pats announced that goaltender Carter Woodside had been sent down to the Prince Albert Mintos, who will begin their season Saturday against the Moose Jaw Generals in a 1:30 p.m. battle at the Art Hauser Centre. – Brandon vs. Moose Jaw – 7 p.m.
– Prince Albert vs. Regina – 7 p.m.
– Swift Current vs. Saskatoon – 7 p.m.
– Calgary vs. Kootenay – 7 p.m.
– Edmonton vs. Red Deer – 7 p.m.
– Portland vs. Seattle – 7:05 p.m.
– Lethbridge vs. Medicine Hat – 7:30 p.m.
– Kamloops vs. Kelowna – 8:05 p.m.
– Prince George vs. Victoria – 8:05 p.m.
– Vancouver vs. Everett – 8:05 p.m.
– Spokane vs. Tri-City – 8:05 p.m.